The article covers the history of formation of industrial areas in the urban fabric, from foundation of Irkutsk to the present time. It reviews the key factors that defined allocation of enterprises in certain areas, as well as the influence of the production function on the city development and transformation. Ogly, B. I. (1982). Irkutsk: o planirovke i arkhitekture goroda [Irkutsk: planning and architecture of the city]. Irkutsk: Vost.-Sib. Kn. izd-vo. KAZAKOVA, Valentina. Glimpses of History. Influence of Industrial Areas on the Urban Fabric. project baikal, Russian Federation, n. 55, p. 62-63, apr. 2018. ISSN 2309-3072. 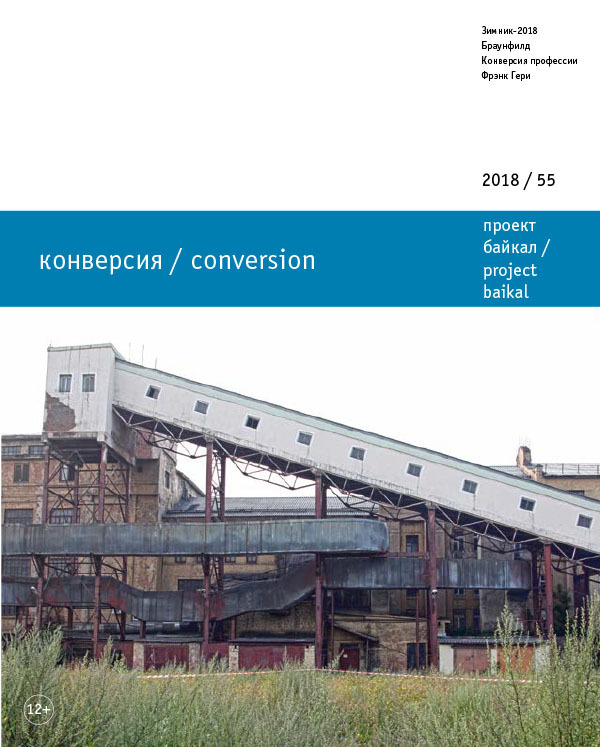 Available at: <http://projectbaikal.com/index.php/pb/article/view/1285>. Date accessed: 23 apr. 2019. doi: https://doi.org/10.7480/projectbaikal.55.1285. industrial enterprises; integration; Irkutsk’s town- planning history; masterplan of Irkutsk; urban fabric.